Charles Cockell is a Professor of Astrobiology at the University of Edinburgh. The UKCA was established in November 2011 and formally opened at the National Museum of Scotland in April 2013. Their core academic interest is the study of life in extreme environments and its application to understanding the habitability of planets. The UKCA is an international partner with the NASA Astrobiology Institute. Since its inception they have developed a range of initiatives, including the development of the world's first underground astrobiology laboratory which it uses for planetary analog research. It has developed research that has spanned across the study of life in extremes and the habitability of extraterrestrial environments. 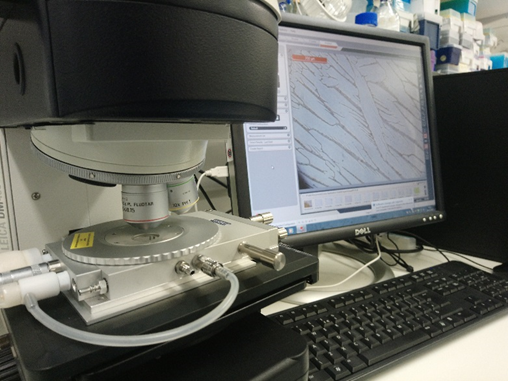 Some of the UKCA’s current projects include: the study of the habitability of icy moon oceans, the colonisation of rocks and the way in which communities develop in rocky planetary crust and the response of microorganisms to multiple extremes. Professor Charles Cockell and his group are currently using the THMS600 stage to simulate the subsurface of the icy moons Europa and Enceladus. In particular it is used to study habitable microenvironments within ice, the phase behaviour of various brines, and how physiochemical parameters related to habitability change as fluids freeze. They also plan to use the THMS350V to understand the surface of these icy moons and how potential biosignatures may be transported, deposited, and preserved during eruption from cryovolcanic plumes.